← Do Surfperch Fry Count Toward the Daily Limit? Why No Abalone Diving/Picking Before 8:00 a.m.? Answer: The new 8:00 a.m. start time is an abalone conservation measure. It reduces the number of low-tide days people will be able to take abalone by rock picking (searching amongst rocks for abalone at low tide). During the spring, many low tides occur much earlier than 8:00 a.m. This regulation change originated from the concerns of wardens who were witnessing large numbers of fishermen coming each and every low tide and taking large numbers of abalone. In addition to all the legal-sized abalone being taken, people were removing numerous undersized abalone while trying to find legal ones. Because undersized abalone often do not survive being removed and returned, they are likely to die. Thus, the impact on the fishery when this happens is probably much greater than the estimated legal catch (over 200,000 abalone annually in recent years). Some people were also using the dim light before dawn to hide illegal activities. Wardens believe the later start time will aid them in enforcing regulations by moving early morning abalone fishing activities to hours with better daylight. The effect of the new start time on total catch is uncertain because people could shift to later hours or the days with low tides after 8:00 A.M. Although there may be a reduction in overall take based on the 8:00 A.M. start time, the increased enforcement benefit is clearly going to assist with compliance of the regulations. Once the data from the change has been analyzed, CDFW will be able to evaluate what the overall benefit to the abalone resource was. 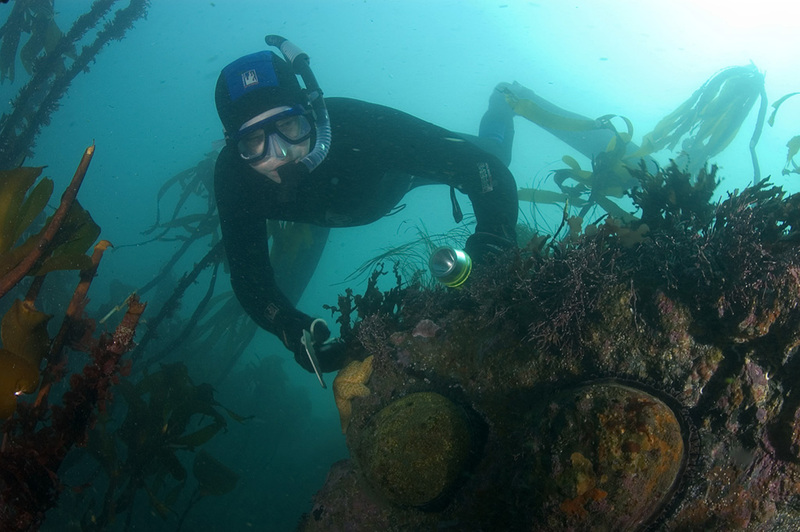 Divers wanting to go out before 8 a.m. to spearfish or do underwater photography can do this as long as they don’t have the means of taking abalone or are searching for abalone before the official state time. If their activities appear to a warden to be taking or searching for abalone before 8 a.m., then they can be cited. How to stop people who are not obeying the rules? Answer: The best thing you can do is to record as much information about the location, situation and descriptions of people and the vehicle(s) they are driving (including make, model, color and license plate number). Provide all of this information at your earliest convenience to our CalTIP hotline at 1-888-334-CalTIP(2258). Leave a message if need be, with contact information, and a warden will receive this information. If officers are in the area when you call, they will come. If they are not able to arrive in time to catch the people who are breaking the laws, they will be aware of the situation and looking for the offenders the next time around. Problems with crows and ravens – depredation permit an option? Answer: You just missed the hunting season for American crows, which runs from Dec. 7 through April 9. Ravens cannot be hunted. The regulations allow for landowners to destroy (shoot) crows that are damaging farm fields or other crops (CCR Title 14, section 472(d)). Answer: Yes. You must be a resident to purchase the license, but after it is purchased, it will be valid for use in California for the rest of your life, regardless of where you reside. This entry was posted in Uncategorized and tagged abalone, abalone picking, CalTIP, invertebrates, Licenses, mollusks, new regulations, nuisance wildlife, regulations. Bookmark the permalink.